It’s Tuesday and classes are scarce. With the Thanksgiving holiday forthcoming, students are already making their way home to see loved ones and prepare for holiday festivities. The Stamp Student Union, however, was anything but scarce. From noon to about 2:45 p.m., more than 200 students gathered to peacefully protest last night’s “no indictment” verdict for white police officer Darren Wilson, who shot black teenager Michael Brown on Aug. 9 in Ferguson, Mo. Under the hashtag #OccupyStamp (now trending in the Washington, D.C., area), students expressed their reactions and concerns through social media. Protesters from yesterday’s march organized the boycott during an emergency town hall meeting at the Nyumburu Cultural Center. To read yesterday’s protest coverage, click here. To read yesterday’s town hall coverage, click here. University Police Chief David B. Mitchell, along with several other police officers, observed the rally. Students wore all black as they marched through Stamp, with protesters stationed along the perimeter of the cafeteria, linking arms and murmuring to each other in anticipation. “I think its great we’re at a campus where people are aware of issues like this,” said junior kinesiology major Marissa Ceaser as she linked arms with those around her. “No justice, no peace,” protesters began, causing customers to look up from their food. “I want to see more students aware and involved because this does affect our generation,” said Christina Powell, a junior government and politics major. As the students alternated between “No justice! No peace!” and “Hands up! Don’t shoot!”, passersby joined the line and chanted along with protesters. Students engaged in 4.5 minutes of silence for Brown, to represent the 4.5 hours that his dead body lay on the street. Those sitting and eating among the protesters seemed calm and uninterested in the situation. The rally continued with one protester naming all of the black men who have been murdered by police in the past decade, becoming emotional as the list continued. “No one has talked about all the killing of young black men,” said Becca Gwira, a sophomore psychology major, as she listened to the incidents. Protesters began to stand up on chairs, voicing their concerns about the Ferguson situation as well as the militarization of the university’s police department. Dozens of students stood up, many emotional as well as passionate during their speeches. University football players also presented their personal opinions, commenting that in every conference and event, they will voice their support for College Park students and the injustice of the Wilson verdict. Slam poetry performances by sophomore Kosi Dunn and two other students concluded the afternoon’s rally. 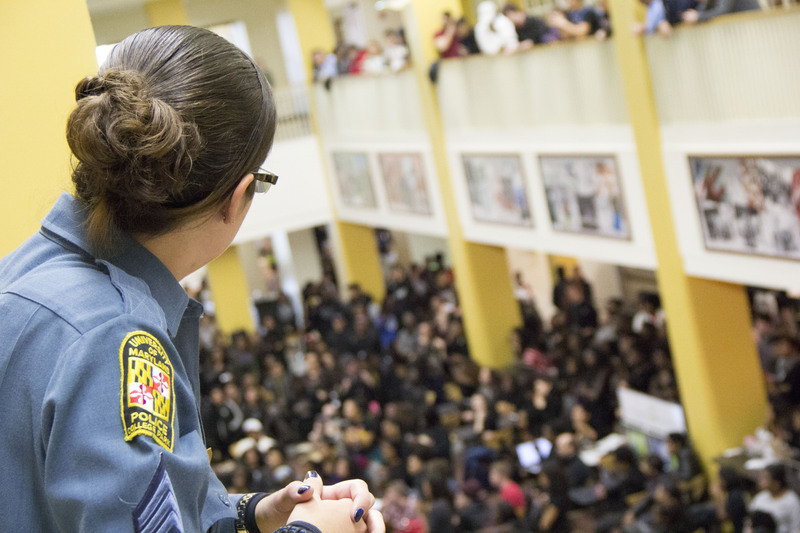 Students plan on organizing more peaceful protests in the future, bringing in UMD students of all nationalities and cultures with regard to Ferguson’s decision and in demilitarizing campus police. As the semester comes to a close, organizers are planning similar protests, Ray said. Reblogged this on ACT UMD.